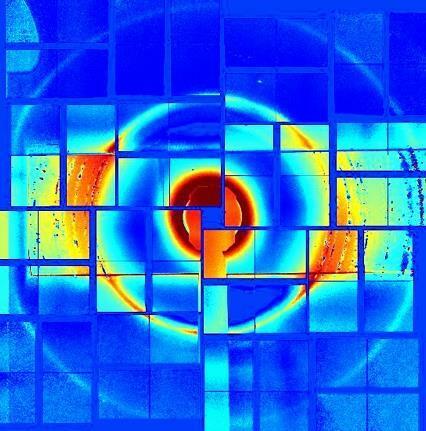 Tiny ice beads comprising a record 80% of cubic crystals have been made by a US–Swedish research team. These exotic ice crystals are pushing the limits of what is possible, raising the question whether 100% cubic crystals can even exist. While most ice exists as hexagonal crystals – the six-fold symmetry is reflected in snowflakes’ intricate structure – cubic crystals have been observed in high clouds. Understanding how these metastable cubic crystals form offers insight into atmospheric processes and might improve climate models. There have been attempts to make cubic ice in the lab, though the highest cubicity reached so far was around 70%. To make 80% cubic ice, a team around Barbara Wyslouzil from Ohio State University and Claudiu Stan from Stanford University’s National Acceleratory Laboratory accelerated nanosized water droplets to supersonic speeds and supercooled them to –45°C. Under these conditions, the droplets freeze within one millionth of a second. Just 100μs after freezing, the researchers determined the crystals’ cubicity by x-ray scattering. The experiment reaches a cubicity close to that predicted by molecular dynamics simulation. As simulations often represent a best case scenario, it may be impossible to make more cubic ice.